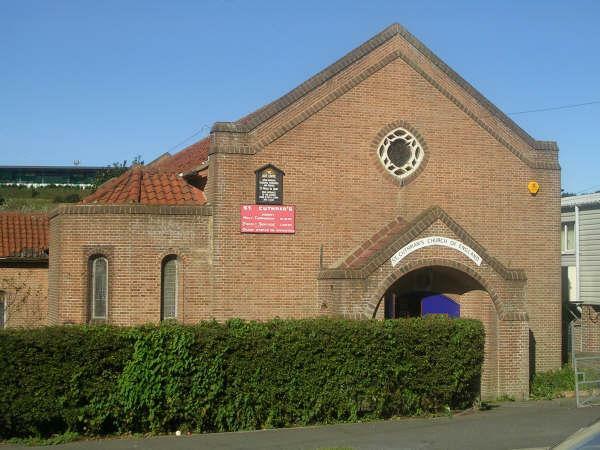 St Cuthman’s Church was built in the 1930s to meet the spiritual needs of the people who were being moved from inadequate housing onto the Whitehawk estate. People remembered that the Church was white but during the Second World War the church building was bombed. Significantly sticking out of the rubble was the large crucifix which had hung inside the church at the front. This was subsequently put into the next church building which was completed in 1952 and dedicated in 1953. It is sometimes called the Children’s Church as local children saved pennies towards its cost. The church seeks not just to meet the spiritual needs of the people in the area but also provides other basic services. In 1987 a ‘drop in’ called the Light Centre was opened. This Centre gives counselling and bereavement support services. There is a team of workers who are always willing to listen and give personal support and referrals if appropriate. The Centre also functions as a food store. The Centre became a registered charity in 1991 and now employs a part-time family support worker. Rev John Wright, Rev David Porter and Reader Jenny Peleg. “St. Cuthman’s Church was originally erected in Lintott Avenue in 1937, but was destroyed on 16 August 1943 by a German bomb with a church-warden buried alive. The new church was built in 1951-2. The church hall was sold to the community association in 1982 to become the Valley Social Centre. St David’s Mission Hall, still standing at the junction of Whitehawk Road and Whitehawk Way, was used before the church opened, and was later used by the Whitehawk and Manor Farm Boys’ Club“. Mr Ariel Bilangel is my brother. I’m glad and grateful to him for this information. Reading this… makes me feel closer to him though he is in Brighton while I’m here in Manila. I would like to know more about St. Cuthman. Who is this saint? Why is the church dedicated or named after him? Thank you very much! We lived at 44 Twineham Road and in the war my father was a fireman stationed at St Cuthman’s church with the air raid wardens . But two days before the church was bombed the firemen moved to Whitehawk bus station -sadly the wardens were killed . My sister Kathleen was machine gunned by a german plane in Lintot Avnue. My grandmother lived at 26 Twineham Road and was at home when St. Cuthman’s Church was bombed. She had a relative from Canada staying who was on active service. He was the husband of my grandmother’s niece and his name was Tubby Domianczuk. When the bomb hit St. Cuthmans it sent a large lump of masonry flying through my grandmothers roof and it lodged above the bed Tubby was sleeping in. He was lucky to escape with his life! My grandfather actually saw the bomb hit the church and after talking to him he has said it was a frightening experience. My nan and grandad, Jean and Leonard Virgo, lived in Twineham Road just along the road from St Cuthman’s church. They lived there from the mid 1950s up until about 1983 or 1984 when they were re-housed due to the old Whitehawk estate being demolished and re-built. They had three daughters, Pamela (my mother who was born in 1952), Janet and Jean. As far as I know Twineham Road no longer exists. I have fond memories of playing out in the street there when I used to visit my nan and grandad as a very young child. Would be very interested to hear from anyone who remembers the Virgo family (especially my mother Pamela) who lived in Twineham Road. I am currently Church Warden at St Cuthman’s. The church is named after a little known Sussex saint who was a shepherd and wheeled his mother in a hand cart. When the withers (straps) broke, he stopped and built a church. This is believed to be in Steyning. His remains are buried in Normandy JFB56A. 8th February is St Cuthman’s day. It is said that when he began to build a church in Steyning, Sussex, he was helped by a mysterious stranger. When Cuthman asked who he was he replied, ”I am He in whose name you are building this Church”. My Grandparents Annie and Victor Elliott, with their three children: Jean (my mother), Peter and Richard, lived at 35 Twineham Road-they had been rehoused there after their house in central Brighton was bombed. On the night that St Cuthmans Church was bombed, my Mum slept through the whole thing in the bomb shelter under the living room table. Her Dad (my Grandad) was an ARP warden and was on the scene, helping out the next day. My Mum and Dad married in the newly built St Cuthmans church in 1952. I now live in St Cuthmans Colse and it’s well changed. I remember being part of the choir that sang at the dedication ceremony in 1953. My Mum and Dad, George and Joan(nee Pattenden) Cook were married in St Cuthmans in 1939. My wife and I were married in St Davids Hall on the 4th of August 1951 as the new church had not yet been completed. I am a Church Warden along with Mrs Janet Novak. It’s a great church. I used to attend St Cuthman’s Church around 1978, when the vicar was Tom Hall and his wife Wendy. They had a large family and I spent many happy years there, before they emigrated to Australia. When I was 12, I used to sing in the chior at St. Cuthmans church which would be arround 1973. Can’t remember the vicars name but he was blind and always knew when playing the organ which one of was playing up. My sister Karen also sang, so did Shirley Chalcraft and David Virgo and his older brother Gordon. David had a fabulous voice. We lived at 242 Wiston Road and briefly at 58 Wiston Road as our chimney burnt. Great times were had at Whitehawk albeit what others thought of it. Does anyone remember the Rolf Family living at 57 Wiston Road, Whitehawk -1960s onwards? I was born at 33 Twineham Road on 26/2/1959, my twin sister is Edie. Pamela, Janet and Jean Virgo lived next door to us. My mum and dad were Ann and Ronnie Mitten and there were 5 of us girls: Maria, Trisha, Rita, Edie, me and Joy, and then my brother David was born and they moved us to 62 Nuthurst Road in old Whitehawk. My grandfather Rev. Francis Musgrave was the Vicar who helped the community build and start the church. According to our family stories, the children and adults from Whitehawk gave money towards the building of the church. I see from a previous comment the church is called the Children’s Church, so the story of the children giving their pennies must be true. I was a choir boy and server at St. Cuthman’s in the war years, I also played the electric organ sometimes for the congregation to sing hyms, I was staying near my father’s airforce camp at Boscombe down when the church was bombed. I was told it went through the organ area where I used to play. I remember some of the names mentioned on this pages (happy days even though there was a war on). The first church was built with the help of children who collected pennies, also farthings in a matchbox. We are using this idea and asking as many people as possible to collect their coins and join us at The Broadway on Sat. 6th Oct 2012 between 2 and 4pm to lay a penny trail, going up towards the church. We are also asking schools in the area if they would like to participate – the idea is for the school children to make a simple design and cover it with pennies. All the money collected will be put towards a noticeboard so people can see clearly what activities are going on at the church and when. Angela Nee Ridpath are we related? I was born at no 6 Nuthurst Rd in 1943. 1932, I was born in Whitehawk Avenue at my aunts Floe’s Lloyds house. A few years later my Mother and Father moved to the corner of Lintot Ave and Twineham. I watched the St Cuthman’s Church being built and when finished I remember the Vicar came to my house and had tea with my mother although I can’t remember his name. There are names running through my head, perhaps some one out there can name him. My Mother told me that he was killed in action during WW11. I went to all Whitehawk schools. During the war we moved to Carlton Hill flats to be next to my Grandfather George Windsor who lived with my Aunt Rose and, which was the pits – a lot of bombing and slums with an awful smell of years of dirt and dust. My Father went into the army and when he came home on leave he advised my Mother to move out as there was danger with bombing, so back to Whitehawk, 115 Wiston Road where we spent the rest of the war. One night a German bomber dropped three bombs, one on the football pitch, on the Church, then Wilson’s Ave. The house where we used to live was damaged. That’s all I can think of at the moment, hoping to remember more. Please enjoy and make any comments. Thank you. I was brought up in Whitehawk. My mother, brother and I lived in Albourne Close in one of sixteen prefabs; ours was number 16. I was a choirboy at St Cuthman’s for many years. I have photos of myself in my rufflet at the laying of the foundation stone. I seem to remember one vicar was named Mr Parfit and I believe there was another named Smith. I started at this church when it was in a wooden hut type building in St David’s down at the junction of Whitehawk Road and Whitehawk Avenue. In the new church I remember that behind the choir stall there were some steps going down into the vestry and by the side of them was a small cupboard door and this housed the three levers that worked the bells. I became head choirboy and was confirmed at the big church in Easton Road, which I believe was called St Saviours. It has been pulled down now and made into flats. We moved out of the estate when they pulled our prefab down in 1963 and moved to the flats in Grove Hill, just off Albion Hill. I spent time at St Cuthman’s a number of years ago and was living in the rectory. I have fond memories of the church and the community and would like to visit again one day. The Vicar of St. Cuthmans from 1955 onwards was the Revd. Albert Walter Parfitt. He came with his wife and six children from having served as a missionary in Canada (during the war) and the West Indies for over 20 years. From there he went to the parish church in Peacehaven, and thence Flimwell. He died in Fletching in the 1970s. I was playing in Twineham Road, my father’s prayer book says 39, sometime before St Cuthman’s was bombed when, what I now recognise to be a Messershmitt 109, flew over me very low. I can still remember the down draft, the cockpit shape and the pilot’s leather helmet. The engine pitch changed to a short racing snort and I now think he was in trouble. I was about 4 years old at the time, and waved furiously at the pilot. My mother was distraught when I went in, crying ‘Why are they trying to kill my baby?’. The pilot never shot at me, my mother later told me cannon pieces were found further down the road. Does anybody know what happened to the plane? 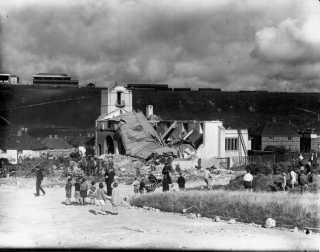 When the church was bombed we were evacuated, but returned to Twineham Road after the war and left Brighton in 1946. My father was the group scout master for almost twenty years at St. Cuthmans church and was a sides man for some time there. A Mrs Cheeseman was his helper for a good many years with the cubs. I lived, with my parents at 214 Whitehawk Road which I notice, no longer exists. We were there when the bomb dropped right oppose our house. Fortunately for us it was a hot summer evening and all the windows were open and the blast went straight through the house causing little internal damage. I was 3 1/2 at the time. In 1947 I joined the church choir in the temporary church, when the vicar was Rev. Bryan (I think). I was in the Cubs and later the scouts which met in the then church hall next to the church. When the church was rebuilt in the 50s I was in the choir but moved on to another church. My grandfather was a church warden when the foundation stone was laid, his name being shown on it. After my voice broke I returned to St Cuthmans to sing in the choir together with my father when Mr. Martin was the organist, who taught me to play the church organ. I remember the Rev Parfitt following Rev. J.J. Smith. We left 214 in the late 60s. Hi John Blunden. I went to school with your sister Elizabeth, I loved listening to her play the piano and sometimes was allowed to stay when Mr Darling gave her lessons. I have a photo of the congregation of St Cuthmans – probably taken during the late 50s – which includes your Mum and Elizabeth, along with Mrs Parfitt and her daughter whose name escapes me. If you would like a copy of the photo, please contact me at barbaraetherton@yahoo.co.uk. Also I would be very pleased to hear from Elizabeth if she would like to get in touch.